Don’t you love watching those cooking shows where the chef is ready to mix his ingredients and a whisk appears out of thin air, and a split second later he reaches for a barrage of spoons and spatulas, all magically within his reach? We know this is not a realistic scenario (the items are obviously set out ahead of time, not to mention that he has an entire crew at his disposal to hand him anything he needs)—but there is some truth to be learned here. When your everyday utensils are well organized and can be located quickly, you can greatly reduce your prep time and keep your kitchen tidy. 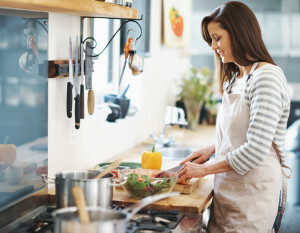 If a more realistic scenario for you is yanking open an overcrowded drawer (which may require some force if that ladle didn’t get put away properly) and then placing several items on the counter just so you can hunt down the meat thermometer that somehow made its way to the very back, here are some ideas to bring order to your kitchen tools. Professional organizers will advise us to group items in “activity zones.” If counter space allows, a basket by your coffeemaker could hold filters, grounds, a scoop, and your favorite mug. Likewise, your cutting boards could stand beside your knife block. It is best to start with identifying what items are used in your everyday activities and designate a handy place for them. Once you’ve separated your most frequently used items and have put them in their appropriate zones, it is time to take inventory of your entire gadget cache. Sometimes the only way to do this is to dump it all in one place so you can see what has accumulated over time; you might be surprised at your tally. Kitchen gadgets are fairly inexpensive, and it’s easy to buy a few at once and equally as easy to forget to toss the old ones away. Years of doing this can certainly add up. Start a discard pile for items you have not used in over a year. If some are nearing the end of their life, are melted, burned or rusted, then discard. Freeing up the space you use every day will free you up to be able to find your gadgets quickly. Kitchen drawers can be like a black hole, sucking in our smaller gadgets to never be seen again. We all had great intentions when we moved into our homes, selecting a place for each item, perhaps using one side of the drawer for spatulas, another for the salad tongs. But when you add in the nutcracker, pizza cutter, and handheld can opener, and it can get messy quickly. When you’re ready to place the items in the drawers, consider one of the many drawer organizer kits available in stores or online. The newest products are adjustable, such as Rev-A-Shelf, which includes a series of wood dividers and clips (imagine a miniature bookshelf on its side), and DrawerDecor, which features “divitz” (tiny blocks) that you can position on a silicone mat in any combination along a series of grooves, creating a notch to place your gadget and lock it in place. Both basic kits retail for about $30 per drawer. For a less expensive option, traditional plastic flatware trays work well for other items. (That short meat thermometer rests easily in the smaller section, by the way). You can also purchase individual small plastic containers and line them with your favorite scrapbook paper design. 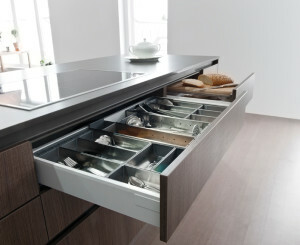 Be sure to line the drawer first with grip liner so the containers don’t move around when you open and close the drawer. 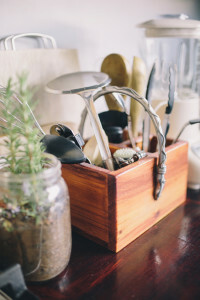 If you have maxed out your drawer space, think about pulling out your longest and bulkiest tools, such as that ladle or whisk or potato masher, and placing them in a decorative container on the counter. For a clean look, consider placing all of your wooden utensils in one container. 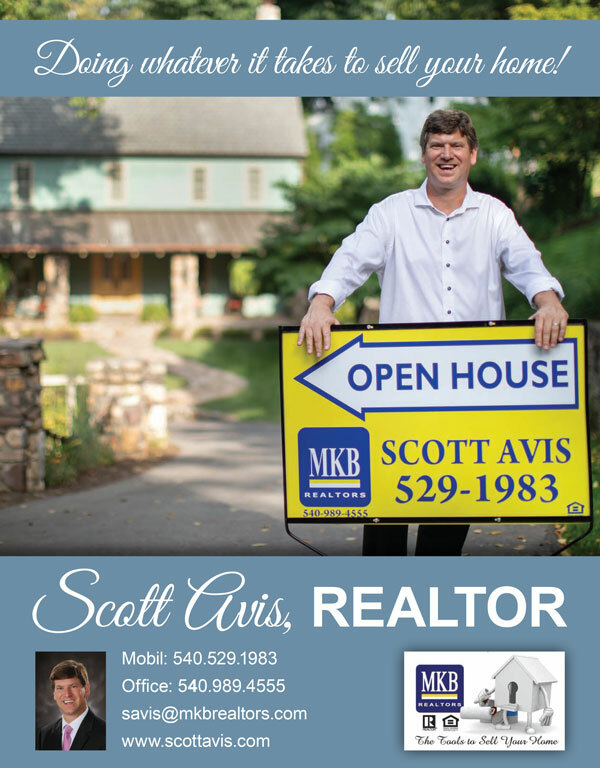 If you’ve taken an inventory and still require more space, there are other solutions. Magnetized strips are becoming very popular. Mostly used for knives, these strips of aluminum or heavy duty stainless steel (the more expensive option) can be adhered to the backsplash or under the top cabinets and hold the blades. They come in different lengths. Some come in a wood look and can also have hooks for those utensils that can easily be hung from holes in their handles. If you don’t use a knife block, or have too many knives for one, a strip is one of the safest ways to store them. 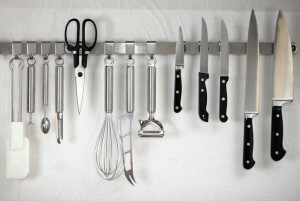 They keep knives out of reach of children and keep adults from risking a cut when rummaging through a utensil drawer. Some creative storage solutions include a picture frame filled with chicken wire and small hooks, or taking a tip from your dad’s workshop and using a pegboard. You can even install small shelves under the top cabinets and place decorative baskets there to hold certain utensils, or you can install pull-out drawers. 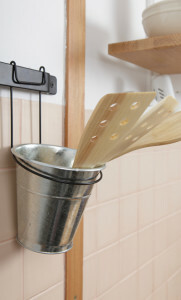 A basket hanger on a nearby wall or even the back of a pantry door could be a practical solution. At a time when families are busier than ever and just having the time to cook is a luxury, take a cue from those TV chefs and keep those gadgets close at hand so you can prepare a meal quickly and become the star in your own kitchen.